For many Americans, saving for retirement seems like a daunting task. Investors often face a dizzying array of choices, from pre-tax vehicles like employer 401(k) programs to after-tax options like Roth and other individual retirement accounts. At the time of retirement, there are more choices to be made regarding the timing and source of distributions. For each of these decisions the stakes are high. Making the wrong choice can cause unnecessary tax burdens and potentially leave insufficient funds for a comfortable retirement. Fortunately, there’s help. 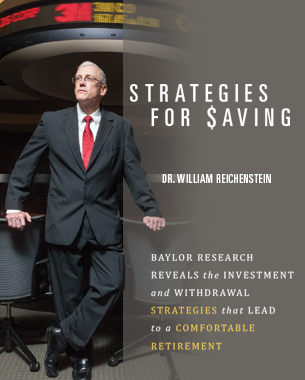 Dr. William Reichenstein, the Pat and Thomas R. Powers Chair in Investment Management at Baylor’s Hankamer School of Business, has taught and performed research in finance since 1978. His research helps individuals maximize the value of their retirement savings by optimizing strategies both during their working years and later during retirement. His work has appeared in popular publications such as Barron’s, Forbes and Smart Money, and he is a frequent contributor to the Wall Street Journal. While many people don’t give much thought to the distribution of their investments, Reichenstein says that even those who take an active approach often don’t make the best decisions on where to allocate their assets – an error that can be compounded later in life if the investor does not consider tax implications when taking distributions after retirement. In addition to strategic management of TDAs, Reichenstein’s research also helps retirees decide when to begin taking benefits from Social Security, which can be an especially complex decision depending on life expectancy and earnings history. In addition to his appointment at Baylor, Reichenstein is also head of research at Social Security Solutions, Inc., a firm he co-founded that has developed software to help individuals decide when to begin receiving their Social Security benefits. Users can input information on their birthday, life expectancy and Primary Insurance Amount (i.e., their benefits level at full retirement age), then the software provides customized guidance tailored to the investor’s specific situation. The company also provides software to help financial planners advise their clients. Reichenstein says his research is important not only because of how it helps individuals manage their money, but also because of how it positively impacts his students. Even though relatively few of his undergraduate and graduate students will pursue careers in private financial management, they will all be responsible for making decisions about their own personal finances. He sees helping his students become knowledgeable about retirement planning as one of the biggest benefits of his work.